Summary: Little is known about the early life histories of Atlantic sea turtle species. Among the turtles found in the western North Atlantic, the life history strategy of the loggerhead (Caretta caretta) is best understood, yet little is known about this species during its early pelagic life. Neonate tracking studies have been directly limited by a lack of small-scale tracking technologies capable of remotely recording the animals' positions over the longer term (weeks, months, or longer). Existing data are few and based on labor-intensive visual observations. With the exception of a few hatchlings tracked up to three days (Witherington 1995), migratory paths and behavioral data are limited in both sample size and duration. Filling these data gaps requires a new technological approach. We developed tag attachment methods and started to field-test small-scale solar-paneled “bird tags” on lab-reared neonate loggerhead sea turtles in 2009. These tags are newly adapted for a marine environment and have the potential to broadly identify neonate nursery areas and to help quantify the dispersal patterns and offshore movements of Florida's neonate loggerhead turtles. To continue this research project, we propose to further refine and ground-truth tag attachment methods on lab-reared neonate loggerheads and evaluate the performance of these traditionally terrestrial animal tracking tags in a marine environment. This study will provide essential data to build a more robust sample size in order to better test the applicability of “bird tags” for use in marine environments. The methods used and tested in this study may be adapted for other sea turtle species or other small organisms. There is strong potential for interdisciplinary and cooperative consortium-building among agencies, ecologists, oceanographers, federal and state managers. This study will provide the foundation for a continued research effort that will broaden sample sizes and include other sea turtle species. Results: During 2010, hatchling sea turtles were collected for lab-rearing. In the third week of October, the first turtles reached sizes ≥240g (>11-12 cm straight carapace length). Two turtles were outfitted with 9.5 g Microwave Telemetry on October 17, 2010 and released in the Gulf Stream off of Riviera Beach, Florida on October 18th (Table 1, attached). Two more turtles were satellite tagged and released in the same area January 4, 2011. These turtles ranged in size from 11.7 to 12.3 cm straight carapace width and were 109-173 days old. These tags transmitted from 31 to over 136 days. Turtles remained in or within close proximity to the Gulf Stream throughout their entire tracks. Turtles traveled along the eastern or western frontal edges of the Gulf Stream off the eastern coast of the US and were observed in association with the edges of mesoscale features (eddies). All turtles traveled as far north as Cape Hatteras, NC; three turtles continued on to the northeast into the north Atlantic. All tags provided high quality ARGOS location codes. 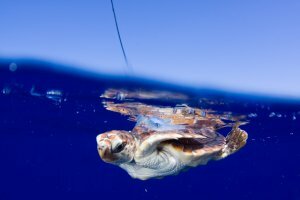 The solar-powered tags were also fully or optimally charging with each transmission duty suggesting that the turtles were likely remaining at or near the sea surface and experiencing little to no biofouling.